rec. July/August 2012, Victorian Theatre, Salomons Estate, Kent (UK). Josef Guretzky was a native of Moravia, now part of today's Czech Republic. Robert Rawson's booklet notes for this release outline Guretzky's courtly employment history, absorbing the Italian influence while with the court of Schrattenbach and his subsequent move to Bavaria and the court of the cello-mad Rudolf Franz Erwein. In 1740 he ended up in Dresden where his only Violin Concerto was composed, a virtuoso work most likely written for Johann Georg Pisendel, leader of the Dresden court orchestra. Apparently unable to secure a post in the town, Guretzky returned to his homeland, becoming Kapellmeister for the region's Bishop and composing church music as well as a now lost opera. Only nine cello concertos by Guretzky have survived, and two of these are incomplete. While adhering to ritornello form these works also have an individual approach to the give-and-take relationship between soloist and ensemble which gives them a finely-wrought sense of integration and a chamber-music feel which makes them feel both antique and filled with sprightly dynamism. Rawson points towards characteristic rhythmic features which contribute to the sense of energy which permeates these pieces, with plenty of activity even in the slower central movements. Vivaldi can be heard amongst the Italianate influences, and the decorative nature of both the solo and ensemble writing gives each work a strong sense of intricacy and detail while at the same time being very easy on the ear indeed. An interesting extra is the Fugue attributed to Bohuslav Matěj Černohorsky, who was a teacher of Tartini. This adds a nice bit of solo contrast in the midst of the programme but is also related to Guretzky's concertos in its use of similar rhythmic devices. 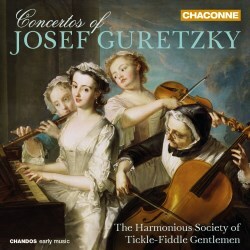 Magnificently named, The Harmonious Society of Tickle-Fiddle Gentlemen play these works with a single player per part with a harpsichord continuo, the selection of instruments including a double bass and following documented practice for the period. The resulting sound is both crisp and attractively full, and with a plethora of premières on this disc there can be no complaints in terms of freshness. If you are looking to expand your experience of 18th century music from an unexplored mid-European source then this is a highly enjoyable place to find such delights.